There are some places that seep into your bones and become a huge part of the person you become. The San Francisco Bay Area is one of those places for me. I wasn't born there, but I lived there through most of my 20s. We recently took our sons on a vacation there so they could see the places that mean so much to us, and I am currently working on a series of paintings based on my photos from this trip. There are a few more paintings I plan to do in this series, but these are the paintings I've done to date. I plan to debut these paintings at the ValeArts Fall into Color show and hope to find other venues to show them all together in the future. 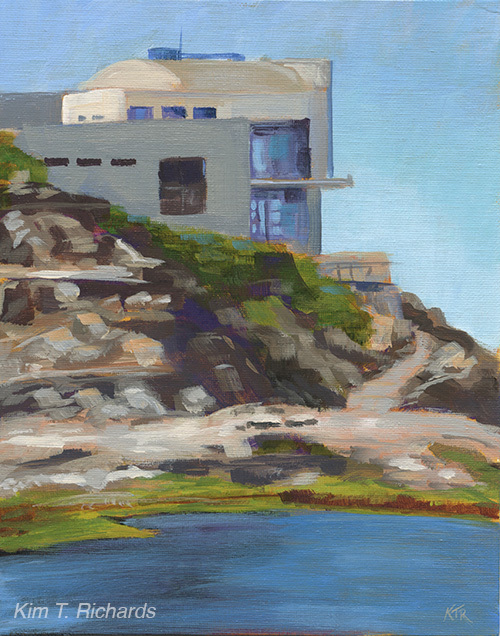 When I lived in San Francisco, I would often go to Ocean Beach near the Cliff House restaurant. Whenever I needed to think, I would hop on MUNI and head straight to Ocean Beach, and walk across the remains of the ruins of the Sutro Bathhouse to sit on the rocky outcropping beneath the Cliff House restaurant (which was smaller and less fancy in those days) I would sit and watch the waves crash against seal rock for hours and hours. Despite the many tourists, it is a delightfully peaceful place. One of my favorite destinations of this trip was the Armstrong Redwoods. I had not been there before, so this beautiful redwood forest was new to me as well as to my sons. 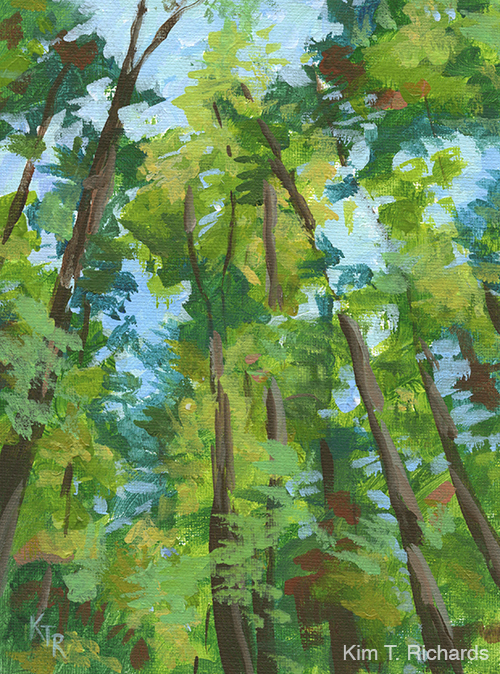 This painting is from a photo I took looking straight up into the treetops. I had seen redwoods many times before, but I am always in awe of the grandeur of these stately giants. After spending the early part of the day in cool shadow at Armstrong Redwood forrest, we drove into the bright sunlight and peaceful secluded beaches of Bodega Bay. I was fascinated by the vibrant blues of the Pacific Ocean and greens of the grasses and ice plants on the cliff juxtaposed against the beautiful subtle grey of the rocks. 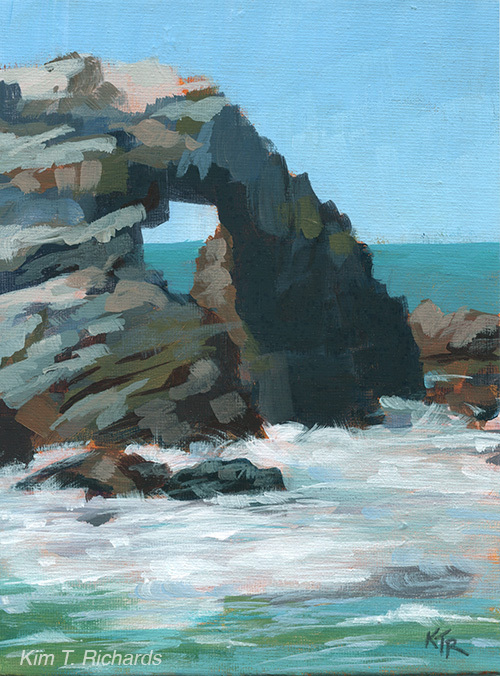 There are at least three more paintings in this series, but I may do more than that. I think its a pretty good excuse to go back to the Bay Area for more reference!